I found Wolf Creek the new-fangled way, on the internet. It is a find, indeed, an affordable gem that gets high marks for playability and hospitality. When I played the course Tuesday morning, it was in outstanding condition for this time of year. Tees, fairways, rough and putting surfaces are green and groomed. The greens, full of slope and subtle breaks, already are rolling quick. They look good to the eye, too. Depending on your point of origination in the Greater Cleveland area, the trip to Bastian, in southwest Virginia just inside the West Virginia border, is 340 to 370 miles. The lion's share of those miles are on Interstate 77.
. You'll turn right and travel about five miles down a twisting road through some pretty country until you see the golf course on your left. Take my word for it, the drive isn't that long and you'll be glad you took it. The main driveway carries you by a large pond and leads to a bridge over a creek. The bridge is designed to carry cars, trucks and golf carts. Bear to the left of the three-story, wood-sided clubhouse and follow the signs to the bag drop and parking lot. Once you're in the clubhouse and ready to pay for the round, chances are you'll be dealing with Don Dean. He's 60 years old and has owned the course since 1986. He was a coal miner for 15 years before he bought the course with three partners, each of whom he's bought out in the years since. "This is a working man's course. Ain't no millionaires here,'' he told me, smiling. The designer of record at Wolf Creek is Maurice Brackett. 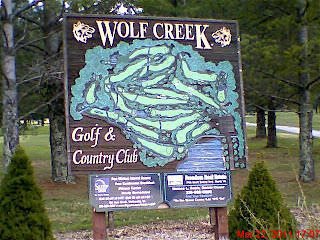 The original owner and developer of Wolf Creek, the late John Wilkerson, engaged Brackett to convert what had been a private hunting lodge with a six-hole golf course into an 18-hole track. There are 18 good holes at Wolf Creek. Four of those holes are exceptional. No. 6, a 372-yard par-4, requires 180 yards of carry and good placement of the tee shot to a raised fairway. The second shot is blind to semi-blind to a green that sits beneath the fairway and is guarded by a pond on the right front. The green has a pronounced back-to-front slope, too. No. 12, a 388-yard par-4, is framed by a creek on the right and left sides. Accuracy off the tee is at a premium. No. 13, a par-3 listed on the card at 208 yards, came up as 228 on my range-finder. Into a stiff wind, I figured it to be playing at 240 with the first 120 over water. No. 17, a 370-yard par 4 with an elevated tee, required accuracy off the tee and steadiness on an approach shot that must clear a creek running across the fairway about 30 yards in front of the green. Dean said his favorite hole in No. 16, a 150-yard par 3 with a substantially elevated tee that wasn't yet open Tuesday. Wolf Creek has a pro shop with bags, gloves, hats and other essentials. It also has a nice snack bar that offers tasty at-the-turn fare. Breakfast is served on Tuesday, Thursday and Sunday. While the course never officially closes, Dean said the heart of Wolf Creek's season is late March-early April through the end of October. This time of year, he gets a fair amount of business from golf "snowbirds'' making trips south from Ohio, Pennsylvania, some eastern seaboard states and Ontario, Canada. 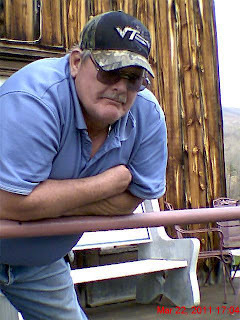 "I get more from Ohio than anywhere else,'' Dean said. The overall golf experience at Wolf Creek is positive in every way. Dean and his staff take a lot of pride in maintaining the course. Little details like daily raking of sand bunkers attest to that. The yardage markings are OK, with blue (200), white (150) and red (100) ground stones. I would recommend bringing a yardage range-finder. Be careful on the cart paths, which are bumpy in spots because of spreading tree routes. 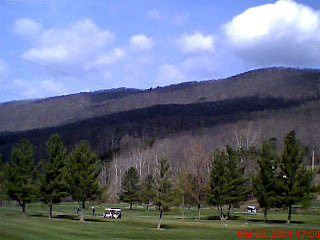 With hills and trees framing backdrops on very hole, Wolf Creek is easy on the eyes. I spoke to some of the regulars when I was there, and each of them said the place is spectacular in the fall when the foliage colors are at their peak. , in the Bastian Plaza is Pizza Plus, a family-owned franchise that offers all-you-can-eat lunch buffet (salad, pizza, beverage) for just $8. Good food, nice price. There are no hotels at the Bastian exit. I'd recommend driving 20 miles south to Wytheville (with-vil), where there are plenty of affordable hotels. I booked a room at the Sleep Inn just of I-77 at Exit 41. Taking advantage of an on-line offer that came from Expedia, I stayed for $52.82 with tax. It's a clean place with an acceptable continental breakfast. There is a Super 8 adjacent to Sleep Inn and a Best Western nearby on the same access road. I stopped at both places and would recommend either. Sleep Inn is next door to the Sagebrush, a first-rate restaurant that specializes in steaks, BBQ, burgers and basic seafood. Entree prices range from $8 to $21.